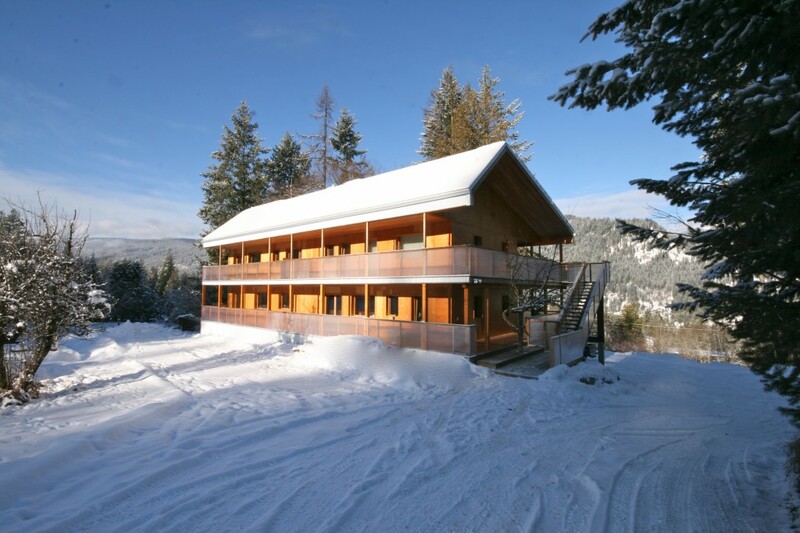 The Bedford RoadHouse, a certified Passive House Triplex near Nelson BC is a joint venture between Cover Architecture and local design/build, with financial support from the Province of British Columbia and Fortis BC. The project began in 2009 as a response to an RFP put out by the Province of BC to build “Super Efficient New Construction”. 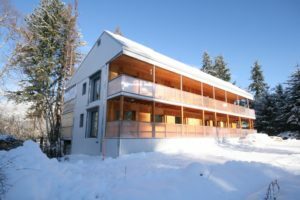 The projects were to meet EnerGuide 88 or Passive House certification, and involve partnerships with local municipalities and educational institutions. Successful proponents would be given financial support, through Fortis BC, to assist in covering the costs associated with super energy efficiency. Cover Architecture and local design/build were given a mandate to build five residential units. The first three units is Bedford RoadHouse. A duplex called 1010 Fell, under development in Nelson BC, will create the other two units. The walls are a triple stud-frame system- two outer walls, the vapor barrier, and an inner insulated stud-frame called the installation cavity, within which the electrical and other services can be run without penetrating the vapor barrier. The service cavity is critical in achieving the required maximum air leakage rate of .6 ach. The roof is a standard truss with an additional installation cavity. The floor is wood I-joists. The basement is an unheated service space and is not considered part of the Passive House envelop. The basic concept of the design utilizes the ideas of core and shell. The envelope of the building is the core, around which the exterior shell is wrapped. In between the two are inhabitable spaces utilized for a variety of purposes. On the south, each suite has an enclosed solarium. On the north are substantial service spaces, used for storage, social activities and a variety of general tasks. On the east is an open deck facing the rising sun. The west does not have this interstitial space, as it is directly adjacent to the neighboring property and to reduce the overall length of the building. The southern overhangs create the required summer shading while maximizing winter sunlight. 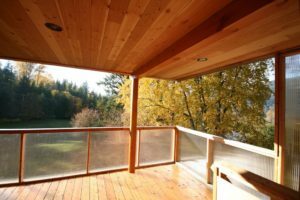 All three decks reduce the effects of wind-wicking-increased heat loss due to substantial air movement. These overhangs also direct seasonal moisture away from the envelop of the building. The increased exterior space, built at a substantially reduced rate as compared to the insulated envelop, increases the livable space of the building and allows for the design of relatively small suites. This design approach also encourages active outdoor living. 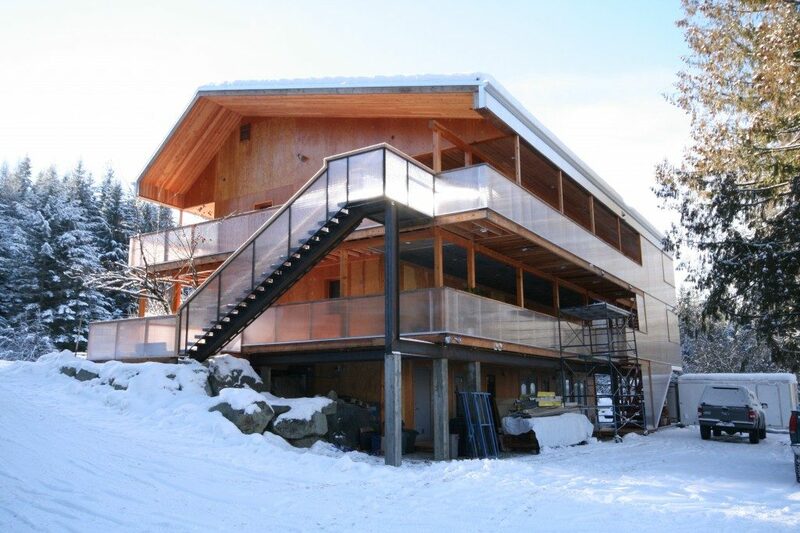 Bedford RoadHouse received the North American Passive House Design Award 2015.